Ya Ya’s Mediterranean Euro Bistro @ Corbin Park 7021 W 135th St.
As if the eclectic menu at Ya Ya’s Mediterranean Euro Bistro wasn’t enough of a reason to visit, its unique happy hour certainly is. Unlike most establishments, happy hour is offered every day from 3-6 p.m., seven days a week. Head out back to the comfortable patio and enjoy a glass of wine and an appetizer from their special happy hour menu, such as the Chicken Piadini - a flatbread with roasted chicken, bell peppers, feta, hummus and red chili oil. Rock & Brews @ Prairiefire 5701 W. 135th St. This high-energy, family-friendly restaurant, in collaboration with world-famous rockers Gene Simmons and Paul Stanley of KISS, serves up an array of international and craft beer alongside tasty American comfort food, including burgers, wings, salads, pizza and more. There’s a kid-approved menu for pint-sized rockers, and if Fido is in town, no worries: Pooches are welcome and even have their own custom treats. 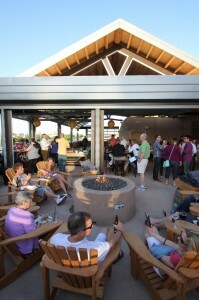 Lounge on the comfy outdoor patio with a cold brew and watch Prairiefire’s hustle and bustle. OP 1906 Bar & Grille @ Sheraton Hotel 6100 College Blvd. Located in the Sheraton Hotel lobby sits the contemporary, yet intimate OP 1906 Bar & Grille. Enjoy a light breakfast in the dining room, family dinner on the patio or a nightcap at the mahogany wood bar. The menu is full of American fare classics, including plenty of family-friendly favorites. Not staying at the hotel – no worries. They offer two hour complimentary valet parking. The BrewTop Pub & Patio @ Corbin Park 6601 W. 135th St.
With 24 local and non-local craft beer taps, daily specials and a 2 - 7p.m. happy hour, this sports bar is a must – especially on the weekends when it turns into a live music venue. Their calendar of events is up-to-date so you never miss a show! The rooftop dining area is great for small and larger groups, while the main dining area turns into a dance floor. Maloney&apos;s Sports Bar & Grill @ Downtown Overland Park 7201 W. 79th St.
Maloney’s is THE sports bar in town! With, what seems like, an ever expanding patio, a heated awning, rooftop bar, over 50 HDTVs and daily specials, you’re sure to get a great view and great deals every day! Maloney’s can hold private events up to 75 people. So, whether you need a place to host a happy hour or watch the big game – check out the private party options. Pig & Finch @ Park Place 11570 Ash St. Pig & Finch is a contemporary gastropub that combines the social elements of British pubs with more upscale, diverse dishes and libations. Its location among the shops of Park Place keeps you right in the middle of it all, whether you want to explore before or after your meal. The patio wraps around the restaurant, giving you a choice between sidewalk seating under the trees or a more secluded setting on the other side. Pinstripes @ Prairiefire 13500 Nall Ave. Bistro, bowling and bocce combine at this sophisticated destination that’s also a family-friendly spot. Choose from mouthwatering appetizers like tenderloin sliders, a well-curated wine and cocktail list (and local craft beer), pizza and flatbreads and entrees such as lasagna, baby back ribs and juicy cheeseburgers. The pizza, pasta, burger and sandwich menus will satisfy the kids’ appetite from bowling. Head to the rooftop for fun in the sun or for a game of bocce under the stars. La Bodega @ Town Center Crossing 4311 W. 119th St.
La Bodega gave the area its first taste of the authentic Spanish cuisine known as tapas when it opened in 1996. Its second location at Town Center Crossing boasts a patio nearly the same size as the restaurant. Choose several small plates from the hot and cold tapas menu to share and grab a table outside, where the hardest decision you’ll make is whether to order the popular house-made sangria rojo or blanco. You’ll feel like you’re in Barcelona—if only for the afternoon. Sullivan’s @ Town Center Crossing 4501 W. 119th St.
Intimate sidewalk patios have a place and time, but if you’re in search of less leisure and more liveliness, Sullivan’s is the perfect setting. The well-appointed space is furnished with a mixture of comfortable couches and tables and chairs, making it ideal for large or small groups. A stone wall encloses the perimeter, providing seclusion from the shopping center, but keeps you in the middle of the action. Helmed by chef-owners Megan and Colby Garrelts, Rye is known across the region for its New American fare and has steadily gained national attention since Chef Colby won the 2013 James Beard Foundation Award for Best Chef: Midwest. An extensive stone patio is anchored with a brick fit pit and surrounded by comfortable furniture, making it a perfect place to dine anytime. By day, umbrellas provide shade and by night, lights strung around the patio provide a romantic mood. Coach&apos;s Bar & Grill 9089 W. 135th St. Since 1983, Coaches’ Bar & Grill has been one of Kansas City’s first sports bars. Its rooftop patio has plenty of seating, a fire pit, misters for those scorcher days and heaters for chilly evenings. Their made-from-scratch menu items include Buffalo Pork Tenderloin, Meatloaf, Homemade Potato Chips and the Milwaukee Bloody Mary garnished with a beef slider, asparagus, beef jerky, shrimp, bacon and a pickle spear. Chef Renee Kelly’s namesake restaurant is located inside the historic Caenen Castle, built in 1907 by Remigius Achile Caenen. Be the king (or queen) of brunch, lunch or dinner and dine regally on the lush stone patio while sipping a hand-­crafted cocktail. Chef Kelly, who appeared on Bravo’s “Top Chef” last year, changes the menu based on the rhythm of the seasons and the freshest local offerings from her list of farms and produce suppliers. 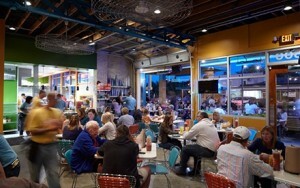 Part of the local Bread & Butter Concepts family, Taco Republic is a local hot spot. You can’t go wrong with their perfectly crafted street tacos and house margaritas. The laid back atmosphere is perfect for the whole family, including a special six years and under menu! Stop by for a casual lunch at the picnic tables, grab a bite to go at the walk-up window or bring the whole crew for a fiesta! If you’re in town for Cinco de Mayo, this is the place to be! 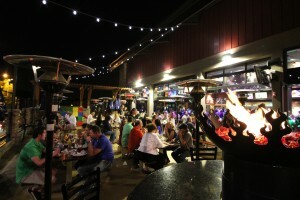 See a full listing of metro area patio dining restaurants here.